3 Nov 2015 – As time passes, a bona fide message emerges from within the Fukushima Daiichi Nuclear Power Plant disaster scenario, and that message is that once a nuclear power plant loses it, the unraveling only gets worse and worse until it’s at its worst, and still, there’s no stopping it. Similar to opening Pandora’s box, there’s no stopping a ferocious atom-splitting insanity that knows no end. Four years of experience with Fukushima provides considerable evidence that splitting atoms to boil water is outright unmitigated madness. After all, nuclear power plants are built to boil water; yes, to boil water; it’s as simple as that, but yet at the same time it’s also extraordinarily complex. Conversely, solar and wind do not boil water and are not complex and never deadly (Germany knows). Thereby, the bitter truth behind a major nuclear meltdown shows its true colors: “Impossible for the utility to chart the course of its planned decommissioning…” is very definitive, divulging the weak underbelly of the fission-to-heat process; only one slip-up, and it’s deadly dangerous and likely out of control! 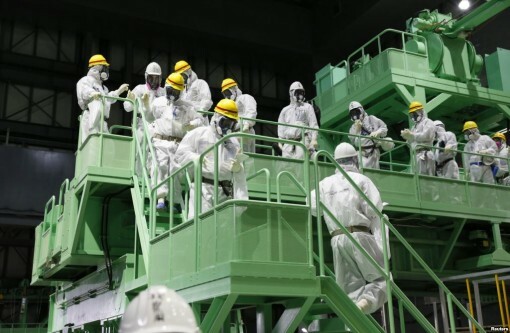 Not only that, but the entire Fukushima Daiichi Nuclear Power Plant complex is subject to recurring mishaps and setbacks, as well as various technical tribulations, something different going wrong on any given day. And, it’s always big, never small. TEPCO also detected deadly radiation levels outside of reactor No. 1. According to a direct quote from the article: “People exposed to the maximum radiation dose for some 45 minutes will die.” Death in 45 minutes! The potency contained within 9.4 Sieverts (Sv) is enormous. One Sievert, which is a measure of the health effect of radiation on the human body, is normally considered a massive dose, causing immediate radiation sickness. But, since levels beyond one Sievert are rarely, if ever, encountered in the normal course of everyday life, the industry standard uses millisieverts (mSv = 1/1000th) or microsieverts (uSv = one millionth of a Sievert) when measuring radiation. Miserably, eight (8) Sieverts causes severe vomiting, severe headache, severe fever, incapacitation, and a 100% death rate over a period of time greater than 10 minutes within 48 hours (Radiation Survival Guide). Chernobyl is a prime example of the potency of radiation. Immediately after the explosion (1986), radiation levels in the control room reached 300 Sv/hr, resulting in the deaths of the operators of the plant. Thirty years later, radiation levels in the same control room run approximately 8-10 mSv/hr. It’s little wonder TEPCO finds it impossible to plan decommissioning of the Fukushima Daiichi Nuclear Power Plant, which begs the question of if, and when, decommissioning will be possible. Who knows, if ever? Unfortunately, not only is radiation sizzling outside of reactor No. 1, but a pipe connection at reactor No. 2 also shows extremely high radiation levels. Reactor No. 2 is where the hot melted radioactive core (corium) still has not been located. But, then again, with so much hot stuff sizzling throughout the entire Fukushima complex, how are workers expected to locate a melted nuclear core that may have already penetrated the steel-reinforced concrete containment vessel, entering the earth? If total meltdown occurred/occurs, nobody has any idea of what to do next. There is no playbook. It’s likely impossible to do anything remedial once a melted nuclear core has burrowed into the ground because deadly isotopes uncontrollably spread erratically, ubiquitously into the surrounding underground soil and water. Then what? In the final analysis, there is a distinct probability that Fukushima has no final analysis. Reports out of Japan indicate that Fukushima Daiichi Nuclear Power Plant cleanup and decommissioning is severely restricted by extremely high radiation levels and the inability to grasp the details about melted nuclear fuel. What could be worse? Keep reading. Footnote: China plans on building 400 nuclear plants “fast and cheap” over the next few decades. (Source: Oliver Tickell, Does China’s Nuclear Boom Threaten Global Catastrophe? CounterPunch, Oct. 30th.) Answer: YES!